Arizona State University. (n.d.). Vocational training & education for clean energy (VOCTEC). Brochure. Arizona State University. Biogas Sector Partnership Nepal (BSP). (2009). Gender mainstreaming in the biogas support programme, Nepal. Produced for ENERGIA. Carter, N.M. & Wagner, H.M. (2011). The bottom line: Corporate performance and women’s representation on boards (2004-2008). Catalyst. Available here. ECREEE & NREL. (2015). Situation analysis of energy and gender issues in ECOWAS member states. Developed for the ECOWAS Policy for Gender Mainstreaming in Energy Access. Available here. Ernst and Young. (2016). Women in power and utility index 2015. Available here. GE Renewable Energy. (2016). “Women brush prejudice aside at Saint-Nazaire.” Blog. May 11, 2016. Available here. Global Clean Cookstove Alliance. (2015). Scaling adoption of clean cooking solutions through women’s empowerment. Available here. IRENA. (2016). Renewable energy and jobs. Annual Review 2016. Available here. IRENA. (2017). Renewable energy and jobs. Annual Review 2017. Available here. IRENA. (2011). IRENA working paper: Renewable energy jobs: Status, prospects and policies. Available here. IUCN. (2015). Women in environmental decision making: New research from the Environment and Gender Index (EGI). Available here. IUCN, EGI, ENERGIA and USAID. (2017). Energizing Equality: The importance of integrating gender equality principles in national energy policies and frameworks. Available here. Modi, K., Schoenberg, J., & Salmodn, K. (2012). Generation STEM: What girls say about science, technology, engineering, and math. Girl Scout Research Institute. Available here. Rojas, A., Prebble, M. & Siles, J. (2015). “Flipping the switch: Ensuring the energy sector is sustainable and gender- responsive.” In L. Aguilar, M. Granat, & C. Owren (Authors), Roots for the future: The landscape and way forward on gender and climate change. IUCN & GGCA. Available here. SNV. (2015). “Women in Dong Hoi reap initial benefits from ADB-funded climate change mitigation initiatives.” Available here. Woetzel, J. et al (2015). The power of parity: How advancing women’s equality can add $12 trillion to global growth. McKinsey Global Institute. Available here. USAID. (2017). Integrating Gender Equality and Female Empowerment in USAID’s Program Cycle. Operational Policy (ADS) Chapter 205. Available here. World Economic Forum. (2016). The industry gender gap: Women and Work in the Fourth Industrial Revolution. Available here. IUCN GGO. (2017). Increasing girls’ and young women’s interest in STEM and the energy sector. GECCO Webinar. Available here. IUCN GGO. (2017). Fomentar la participación de las mujeres en el sector energético. GECCO Webinar. Available here. WRISE. (2017). Find her keep her: Recruiting and retaining women across renewable energy. WRISE Webinar. Available here. IUCN GGO. (2015). Women working in the energy sector: why are there so few? Presentation by Kristen Graf. “Gender equality in the energy sector: Understanding how renewable energy contributes to empowerment.” Available here. IUCN GGO. (2015). Challenges and strategies to increase and retain women’s participation in the energy sector. GECCO webinar. Available here. 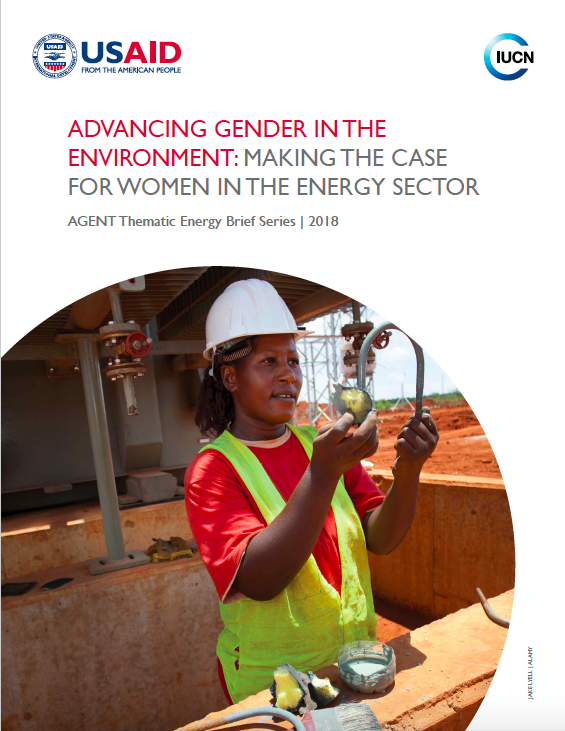 To access the AGENT Thematic Energy Brief Making the Case for Women in the Energy Sector, please click here.